You just need one loose mouth to make an outrageous comment not consistent with reality to start a rumour. Just because a bunch-o-loonies who never watched a proper action movie were humbled by TDK, the best comment they could give was, Heath Ledger will win an oscar. 3)After watching the movie, even though they found it boring people must comment "Wow! What taste, it might made my eyes water". Yeah I am sure there was water under your tightly shut lids and the dusty surface of Mars. 5)If anybody below 25 brand the movie "Cool!" then the movie is out of the oscar race. Its a long list, but if I write all of them, it will put you to sleep and they will consider awarding an Oscar to my blog for it. I watched the movie. Yes yes long back! But I just got tired of all the "oh it will definitely win an oscar" crap. Not that it does not deserve one. I think the movie itself deserves an oscar, but then don't SO MANY MOVIES THAT NEVER WON!!?? Now don't ask "like what?" cause I have watched way too many. Lagaan was quite a laugh when it generated its own hype. A commercial movie, winning an awards that was not even distantly related to anything Indian. Getting back to TDK. Would the freaks be saying the same thing if Heath Ledger hadn't passed away so unfortunately? I mean seriously, how many freaks would have known to say that so and so movie was his/her favourite unless it was on top of an IMDB list? The most they can say to this comment is "Hey I really liked that one"....oh-oh-oh-kay! I certainly thought he was awesome as the Joker. There are very few people who could have pulled it out as well as him. But he should have won one for Ennis Del Mar. If they decide to give one NOW just because he is dead, I doubt he will rest in peace! Besides, (I know this sounds cold, but) even Aaron Eckhart would have generated the same yap yaps if he had passed away! duh! If I have to give my own inputs about the movie, lemme say though the makers still cant stick to one guy to play their lead, I found Bale fits the role really well, he would be my favourite after West. Batman finally wants to settle down in life with his long time friend Rachel. 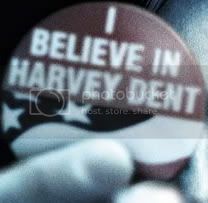 Icing on the cake when Gotham's white knight arrives in the new DA Harvey Dent who knows no fear. But a new breed of scum has arrived on the scene too, in the form of the Joker. Deception, sacrifice, pushing limits all bundled in between enough comic scenes between Alfred and Bruce make for a great movie. One of the best in the year and for a while. Joker says "..You need an ace in the hole. Mine's Harvey"
The ace in the hole from the film makers? Casting Michael Caine as Alfred and Freeman as the legendary Mr.Fox.Gary Oldman as James Gordon. The siren that plays in the background is the master stroke. I believe whatever doesn't kill you, just makes you - S-T-R-A-N-G-E-R! To them you are just a freak, like me. They need you right now, when dont , they will cast you out. Like a leper. Gordon: What difference does that make? Joker: Depending upon the time, he might be in one place or....several! The chase in the lower 5th. Where did they bungle up? 1) Joker - a freak, can just casually wander into a mob without being shot? 2)When you notice a burning bus and placed in a way most obviously indicating that the miscreants want you to take the lower 5th, will a police team transporting Harvey Dent really take the diversion? 3)Why didnt anybody notice, not even Harvey that Bruce Wayne was at the press conference where Batman was supposed to surrender? 4)When Bruce Wayne notices his own employee emerge from a wrecked, how come nobody notices that he not even slightly bothered at his sight? 5)Harvey Dent is the DA of GC and still so dumb that he thinks Batman can be killed by a bullet? My movie craze and amount I spend talking about them might be inversely proportional, but I decided I must have a word about the action movie that impressed such a wide range of characters. This happens a lot of times at the Oscars - veteran actor who didn't win for excellent performances in the past gives a passable one at career's end, and lo and behold he wins! 'm not saying it's right, just "that's show biz." firstly welcome back.watch the downloading at odd times,lest we miss your blogging again. glad to see you blog abt the dark knight,quite a long time after the hype has cooled down.reinforces the fact thats its been one of the best movies in a long time.like you said,i wonder if heath ledger would be given his right share of accolades and be appreciated on the same lines as jack nicholson if he were alive.hope he gets that oscar though. abt your rules for movies to be in the race for an oscar,i completely disagree with the rules.....(yes,esp the swift movement one :P).defying these norms are movies like LOTR,The Departed,Crash....these definitely werent made in slow-mo mode!! for Pete's sake , you don't have to take everything so literally, you ain't new to this blog or me. tats how it shud be..but tats not ta way it is!!!! the movie was very nice. oscar or no oscar, heath ledger will be remembered for that movie for a long time. the efforts he put in was worth it(details of his preparations is in his wiki page).